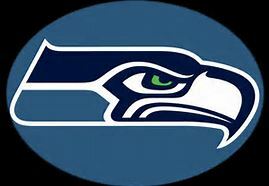 I feel like a belated: GO SEAHAWKS is in order! I made these delicious (seriously, DELICIOUS) buffalo turkey meatballs from Iowa Girl Eats, also featured on Go Bold With Butter’s blog. Ok, they were supposed to be chicken meatballs, but I wasn’t thinking properly, and sent my husband to the store for turkey. If anything, the lean ground turkey made it even MORE healthy (if you consider meatballs healthy, that is). A good friend of mine invited my husband and I to watch the play off game at his house, so I decided to take it upon myself to make a yummy game-day treat! 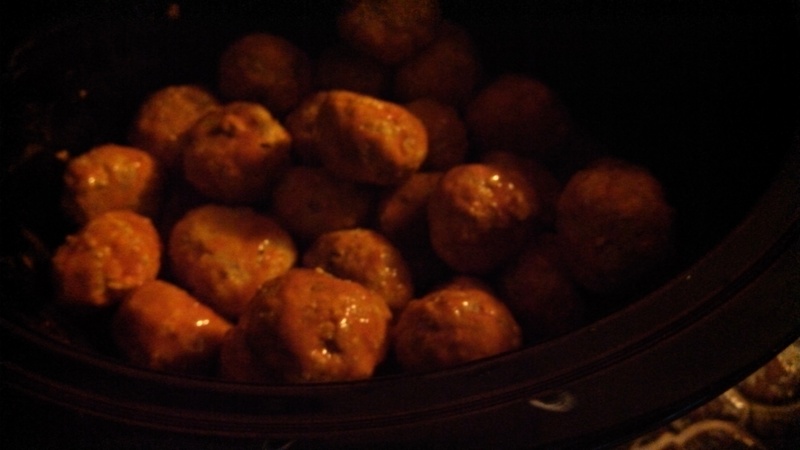 It turned out to be a double-success: the meatballs were fab, plus the Hawks won and are now going to the Superbowl! Anyway, these are delicious. How many times can I keep saying that? I was able to make the meatballs in the oven the night before and refrigerate them, then on game day I made the sauce and warmed them in a deep skillet, before transferring them to my crockpot to take to my friend’s house (once I arrived, I plugged it in on low for a bit, then warm, then off, since they started to almost cook more). I am sure you could also just go straight from the fridge to the crock, if you want to skip the skillet step. They were quite a hit, and I’m posting just in time for the upcoming Super Bowl – I highly recommend you serve these at your party (or heck, just make and hoard them all for yourself). Best part: there was a vegetarian girl at my friend’s house who said they smelled so good that she was actually craving meat, which she has not done in a very long time. I call that a compliment! -Preheat oven to 400 degrees. Stir together red onion, garlic, egg white, bread crumbs, and ranch dip mix in a large bowl. Add ground turkey then mix until just combined. Divide and roll into meatballs. Press cubed or crumbled feta into the center of each ball then close mixture around cheese to seal. Place meatballs onto a non-stick sprayed cooling rack set on top of a baking sheet, then bake for 16-18 minutes, or until cooked through (I don’t have a wire rack and they still came out fine). -Meanwhile, melt butter in a large skillet over medium heat then add buffalo wing sauce and stir to combine. 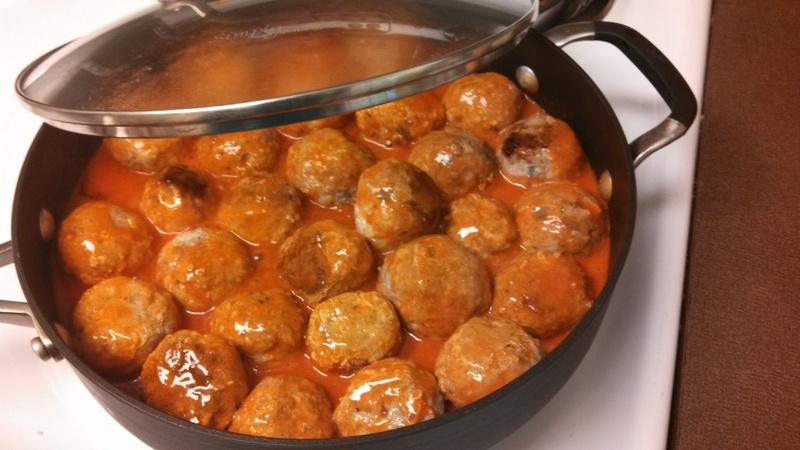 Add cooked meatballs to skillet then use a spoon to coat in sauce. Place a lid on top and turn heat to low to keep warm (this can be done later, depending if you want to refrigerate your meatballs, or serve them right away).